Reach the church, restaurant and viewpoints at the top of Monserrat via Bogota's funicular or tram -- 7.5 minutes on an average 70% grade for about 2300 feet. 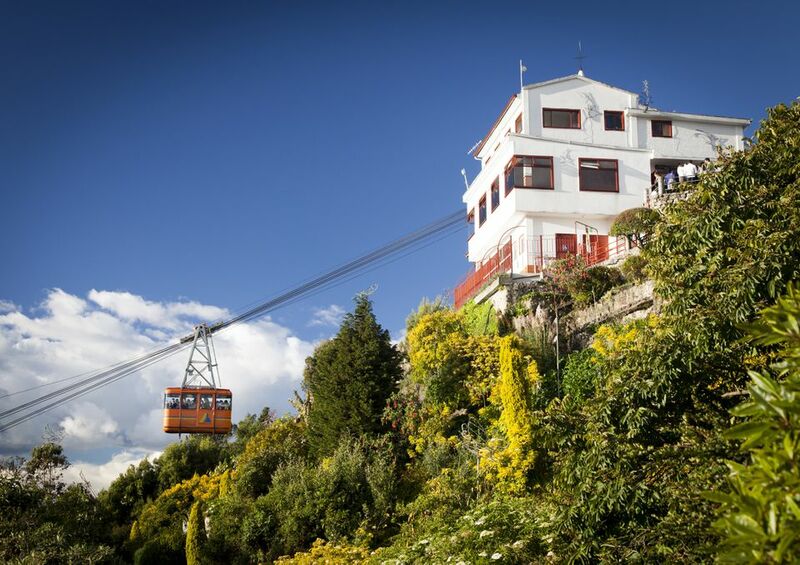 The spectacular ride takes you up Monserrate, the mountain dominating views to the west from Bogota, and to a beautiful church built in the 1600's which is a shrine to El Señor Caído. You can also walk to the church, which is what upwards of 40,000 pilgrims do during the Easter season, though any given Sunday will also see the site thronged with the faithful. La Candelaria is a neighborhood in Bogota that you really must see. The original center of town, La Candelaria is home to some wonderful architecture, charming row houses, and the lovely Iglesia de la Candelaria, pictured above. Plaza de Bolivar in Bogota's center is ringed by the Palace of Justice, the National Capitol, the Liévano building (where the mayor can be found), the Primary Cathedral (Colombia's largest) and circa-1700 Holy Chapel, and the Museum of the 20th July, significant as the house in which Colombians made their Call for Independence on 8/20/1810, launching their first try at independence from Spain. See more photos of Bolivar Square in Bogota: Another View of Primary Cathedral; Bolivar Plaza; Holy Chapel on Bolivar Plaza. Downtown Bogota, with Montserrate in the background. Holy Chapel in Bolivar Plaza. More on Bolivar Plaza: Plaza de Bolivar, Primary Cathedral. Bogota uses are plentiful and cheap, and a pedestrian/bike path bisects town, in some places traveling right beside the sidewalk. Easy to get around this city. Read more about La Candelaria, and see more views of La Candelaria: La Candelaria Streets; Iglesia de la Candelaria; La Candelaria Neigborhood. Read more about La Candelaria, and see more views of La Candelaria: La Candelaria Roofs; Iglesia de la Candelaria; La Candelaria Neigborhood. Bogota's Primary Cathedral and Holy Chapel on Bogota's Bolivar Plaza. More views: Primary Cathedral; Holy Chapel; Bolivar Plaza.